Friends, runners, coun trymen lend me your trainers! Sorry about the disruption to normal blogging service but I've been away on my hols with my gorgeous wife of 25 years, Rosie. We had a great time in Venice and Rome. The weather was fantastic (especially so after all the rain we've had). If anything it was too hot (mid to high 30's). Had loads of pasta so I'll be well carbo loaded. As it was my wedding anniversary I came off the wagon and had a few glasses of wine and beers (but back on again now). I managed to get out for a couple of early morning runs. All in all I seem to have limited the damage to putting on 4 pounds in weight. I got up at 6:00 on Friday and ran round the whole of Venice. I'm now looking for an entry in the Guiness Book of Records for the most bridges crossed in a singel run! I must have run over a hundred bridges in the space of an hour and a half. My Polar has logged an ascent of 55m for the run on what is a completely flat city. It must rank as one of my most unusual runs. Venice is essentially a city of pavements, canals and bridges. Even at 6:30 in the morning there were quite a few people about so I had to engage in a bit of tourist dodging. Overall though the run was trouble free. I tried to keep the route as simple as possible but it still involved navigating the maze of paths and alleyways. Fortunately I didn't get lost and had a fine time ticking off all the best sites in one fell swoop. It was still hot at that time in the morning and it took me a couple of days to properly rehydrate. On Sunday we went to Rome by train, only just. They cancelled our train and didn't bother to tell us, or anyone else for that matter. We'd treated ourselves to a first class ticket and ended up standing up half the way. After Venice's car free environment Rome was a shock to the system. It was actually better, trafficwise, than I remembered it but that's only relative. It was the usual suicide mission to cross the roads. In case you haven't been yet here's a tip to save you being stranded on one side of the road forever: find a zebra crossing and just walk out in front of the traffic. They won't necessarily stop but they will drive round you, unless it's a pelican crossing in which case wait for the green man and the same rules apply. I went out for an early morning run on Tuesday. 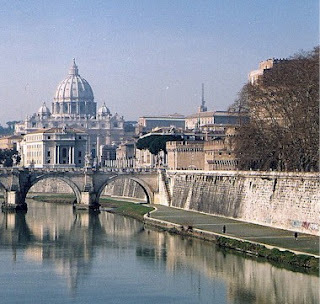 The River Tiber runs through the middle of Rome but unlike most cities Rome seems to ignore it's river. It actually runs in a big culvert about thirty feet below the level of the city. There's also no river traffic bigger than a rowboat as it's not navigable. Alongside it they have built a large twenty foot wide embankment so I went down and ran along that. Nothing much to report on this run other than no-one else seemed to use the perfectly good track. In any other city it would be full of people on bikes commuting to work. I can't believe that the small groups of homeless people camped under the bridges explains the lack of people using the track. Very strange.